Get out your basket full of 2½" strips or a packet of 10" squares; Daisy Cakes is waiting for you! Even the dimensional petals and flower centers are cut from 2½" pieces. Use a large variety of fabrics or a little more “planned scrappy”. 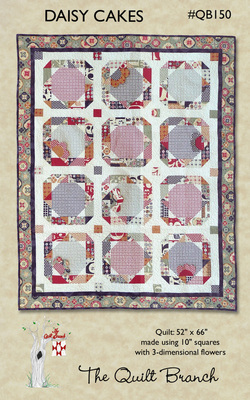 Cutting instructions for using the House or Cottage Ruler from Creative Grids® are included in the pattern, but you do not need either ruler to complete this 52" x 66" quilt. **NOTE: The Cottage Ruler is no longer produced, but the House Ruler does everything that the Cottage Ruler did and more.